The FFI has several corporate members. Mainly based on this support, the FFI is able to perform their continuing activities and develop as a lively and successful society in the future! Donations are always welcome! In any case, please contact the FFI! The next Fracto Course is sceduled from July 10 to July 12, 2019 in Erlangen, Germany. This 2.5 days Course is organized by Susanne Scherrer, Ulrich Lohbauer, Paulo Cesar, and Renan Belli. The FFI e.V. is happy to announce the 2019 Annual Meeting of the Academy of Dental Materials to be held between October 2 and October 5 in Jackson Hole, Wyoming, USA. For further information and registration, click here. Scherrer SS, Lohbauer U, Della Bona A, Vichi A, Tholey MJ, Kelly JR, van Noort R, Cesar PF. 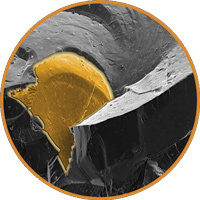 ADM guidance-Ceramics: guidance to the use of fractography in failure analysis of brittle materials. Dent Mater 2017;33:599-620. ... a dental specific and comprehensive guide into clinical fractography. The third Fracto Course has been successfully held in September 2016 in Erlangen, Germany. The Fracto Forum International e.V. regular business meeting took place on August 29, 2016 during the third Fracto Course in Erlangen, Germany. © 2015 by FractoForumInternational e.V.